Jenny Jones, the Green party‘s sole peer, has asked Theresa May, the home secretary, to investigate Cambridgeshire police after two of its officers visited a blogger who tweeted “fact checks” about Ukip policies. In a letter to May, Jones said the incident raised interesting questions about how to deal with relatively new crimes committed on social media and how police react to them. She urged May to start “a short investigation into the procedures of Cambridgeshire police, that allowed two officers to visit someone after a complaint that did not contain a justifiable reason for the visit”. Second, Jones said Home Office advice should be written and circulated as quickly as possible to all forces, outlining what is and what is not illegal on social media. The chief constable of Cambridgeshire police, Simon Parr, has already admitted that the force should not have become involved, and has asked for an internal review into the incident. “I believe in this instance police attendance was not required and I have asked for our approach to this sort of incident to be reviewed to ensure we do not get involved unless there is clear evidence that an offence may have been committed,” said Parr. Parr’s comments followed a visit last weekend by two police officers to Michael Abberton, a Green party member. 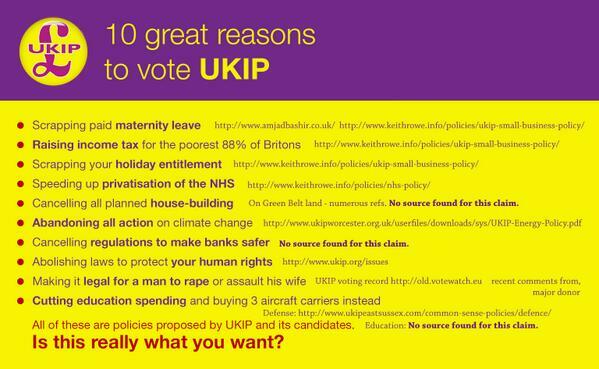 He said he was asked to delete some of his tweets, in particular a retweet of a faked poster giving 10 reasons to vote for Ukip, including scrapping paid maternity leave and raising income tax for the poorest 88% of Britons. The police visit was prompted by a complaint from a Ukip councillor who was unhappy about the tweets. Police said they made inquiries “as to whether any offences had been committed under the Representation of the People Act but none were revealed and no further action was taken”. Ukip complained that Abberton was impersonating and misrepresenting the party. Cambridgeshire police accept that Abberton may have been asked to delete the tweets – passing on requests from Ukip – but that he was not forced to. Abberton, who writes a blog called Axe of Reason, said the two officers were professional and polite, but he did question why they had visited him. Civil liberties groups have expressed surprise at the involvement of the police in the matter. This entry was posted in Activities and tagged Cambridgeshire police, Green Party, Jenny Jones, Rex Jenny Jones, Theresa May by tamesidegreens. Bookmark the permalink.